Police arrested two men in connection with an illegal marijuana grow and seized close to 600 marijuana plants around 5:30 p.m. Thursday at a residence in the 6700 block of Paso Fino Street in Eastvale, a Sheriff’s official reported. Zhu Hua and Ninh Ha. 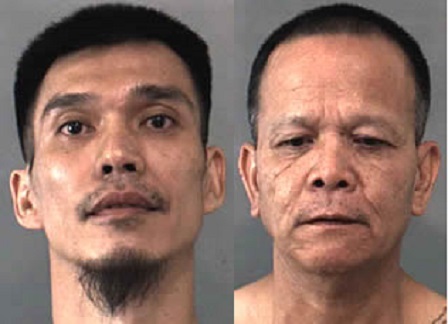 Zhu Hua, 40, of Los Angeles County and Ninh Ha, 49, of Los Angeles County were both arrested on charges of conspiracy, cultivation and possession of marijuana for sale and grand theft of utilities after an investigation revealed that the residence they were in was being used for a large scale marijuana grow operation, according to a Riverside County Sheriff’s report. Officers obtained a search warrant for the residence as part of their investigation and discovered 589 marijuana plants, two pounds of processed marijuana and packaging material. Electricity was being bypassed around the meter in the home and this created a serious fire hazard, Sheriff’s Sgt. Justin Rowan said. Approximately $5000.00 of electricity was being stolen per month, according to Rowan. Police detained and then arrested the two men, who were then booked at Robert Presley Detention Center, Rowan said. This is an ongoing investigation and anyone with additional information is asked to contact to contact Officer Patrick Walls at the Jurupa Valley Station at 951-955-2600.